O'Neill: We were missing key players but were still well beaten. 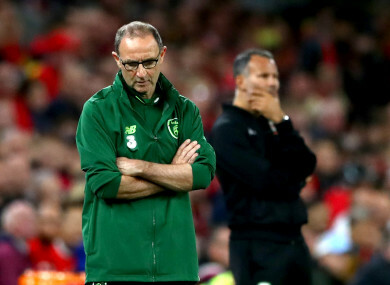 MARTIN O’NEILL POINTED to the absence of ‘five or six Premier League players’ from his squad as one of the contributing factors to Ireland’s chastening 4-1 defeat to Wales in Cardiff this evening. The Ireland manager also insisted his players must show greater bravery on the ball after watching a rampant Wales outfit tear the Boys in Green apart, thanks to goals from Tom Lawrence, Gareth Bale, Aaron Ramsey and Connor Roberts. After a chaotic build-up to Ireland’s Nations League opener saw O’Neill lose the services of Declan Rice, Harry Arter and James McClean, the visitors were outclassed, outfought and outplayed by Wales, who made a thrilling start under manager Ryan Giggs. It was a sluggish and abject performance from Ireland, who less than a year after winning in Cardiff to keep their World Cup hopes alive, slumped to another heavy defeat in competitive action. Speaking to Sky Sports afterwards, O’Neill said: “We were missing some key players but were still well beaten. “Obviously we set out with good intentions. They scored very early on in the game, their second goal from a world-class player was a world-class goal and of course that sets you back and you’re 2-0 down after, what, 15 minutes. It’s a tough way back. It was a hard evening. When asked if the spate of player withdrawals in build-up had an effect, O’Neill added: “I would have thought so. We’re unable to be missing five or six Premier League players and still be able to put on a real big show. We need to be a full strength if we can be. “Now I’m not so sure, I’m not so certain, we’ve actually been at full strength but I’ve not known when we’ve been as decimated as this. “We’ve got a game coming up against Poland and we’ll try and utilise the squad if we can and try and get ourselves prepared for the two games in Dublin. Very important games against Wales and Denmark [in October]. “I think that we need to try and be braver on the ball, that’s very, very important. Email “'We're unable to be missing five or six PL players and still be able to put on a real big show'”. Feedback on “'We're unable to be missing five or six PL players and still be able to put on a real big show'”.